Full Price: $ 250.00 4% off! 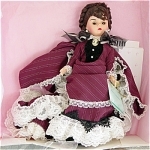 In 1988 this lovely 10 inch Cissette lady doll by Madame Alexander was made in the limited number of 5,000 pieces for the Enchanted Doll House for its 25th anniversary dressed in the costume of the shop's logo doll maiden. She has a brunette wig and moving blue eyes. 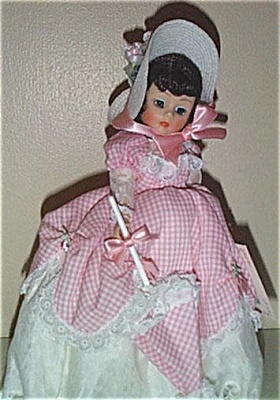 Her Enchanted Doll logo ensemble includes a long pink and white checked Victorian-style dress, high heels and a white straw bonnet trimmed with ribbons and flowers. She is holding a pink parasol. Box may show age. She is near mint-in-the-box old stock with her tag.